Ingredients: Limonene, Polysorbate 80, Polysorbate 20, Phytocannabinoid Rich Hemp Oil, Beta-Caryophyllene, gelatin capsule. Small water-soluble softgel capsules that are taken orally. Water-soluble products are better absorbed than oil-based products. 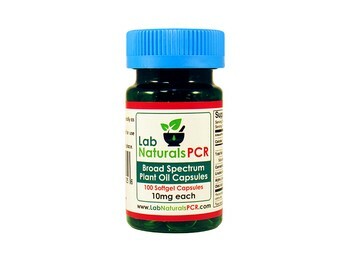 Broad Spectrum PCR – Phytocannabinoid Rich Plant Oil with CBD and other minor phytocannabinoids such as cannabigerol – CBG, cannabinol – CBN, and cannabichromene – CBC, and over 40 naturally present synergistic terpenes. Products are tested both internally and independently for potency, purity, and consistency. Hydrogenated Water and Supercritical CO2 Extraction Process – CO2 extraction allows the operator to tune the extraction using the process parameters (pressure, temperature, time, etc.) to extract specific compounds most efficiently. Ethanol extraction is less specific and will result in a lot of terpenes, waxes, and chlorophyll with your target compound. General CBD Serving Guidelines: Start LOW & Go SLOW! mgs, mLs, 600, 1200, 3000 what does it all mean? - mg stands for milligrams - The unit of weight of CBD per bottle. - mL stands for milliliter - The unit of volume of liquid per bottle. - mg/mL = Concentration. How much CBD (weight) is in how much liquid (volume)? - The number next to “mg” on the bottle is a total amount of CBD (by weight) in that bottle. - 600mg in 30mL --> Each 1mL contains 20mg of CBD. - 1200mg in 30mL --> Each 1mL contains 40mg of CBD. - 3000mg in 30mL --> Each 1mL contains 100mg of CBD. Less is more! By starting low and slowly increasing until you find your personal balance or homeostasis, you may get optimal benefits without wasting money on excess CBD. Please Note: The amount of body fat, duration and severity of condition, GI/Liver function, individual biochemical makeup, and endocannabinoid balance may affect outcome. ATTENTION: Some medications may interact or impact serving size. Please call 412-421-4996 or 412-586-4678 to speak to a Pharmacist about any medications you are taking or visit us at 4227A Murray Avenue. NOTE: Many people feel more mentally alert and focused using CBD so we suggest starting the initial serving in the AM for at least a week before adding a second PM serving. Help us further CBD Research! Fill out our questionnaire and help us collect important data about CBD and your experience! Click here to fill out our PCR Questionnaire. Please call (412-586-4678 or 412-421-4996) if you would like further guidance. Not recommended for use in pregnant women or women who are breastfeeding as there is not enough reliable information on these groups. Please consult your physician before use. For more information on CBD please consult the following paper from the National Institutes of Health: PACHER P, BÁTKAI S, KUNOS G. The Endocannabinoid System as an Emerging Target of Pharmacotherapy. Pharmacological reviews. 2006;58(3):389-462. doi:10.1124/pr.58.3.2. And the World Health Organization’s paper, “CANNABIDIOL (CBD) Pre-Review Report Agenda Item 5.2 Expert Committee on Drug Dependence, Thirty-ninth Meeting, Geneva, 6-10 November 2017.